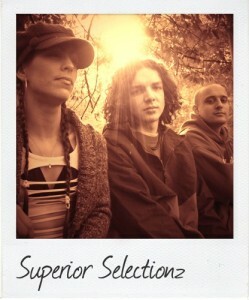 Superior Selectionz are Somerset based drum & bass producers Lawrence Dodge, Sam A’Court and Rich Kingsmill. They formed in 2003 originally as DJs and moved into production a couple of years later. Their first release was ‘Teknique’ on Lockdown Recordings back in 2007, which received airplay from the likes of Klute, Cybin and Bungle. Since then, they have been refining their sound and continuing to produce drum & bass with a progressive edge. Last year saw the release of two EPs on Lockdown, ‘Held Under’ and ‘Triangulation’. In 2005, they became instrumental in the setting up of ‘Rebirth’, a mini bass music festival in the south west. The 1500-strong event showcased leading names in the drum & bass scene, and led on to the formation of ‘Switch’, a club night representing the deeper side of the scene. Gig appearances include Progression Sessions, Innovation in the Sun, Bristol Festival, Random Concept, Bedlam and Infidelity. They are resident DJs at Intrigue, one of Bristol’s longest running drum & bass nights. The last 2 years have been very busy with 2 full length EPs on Intrigue Music featuring label boss Ben Soundscape and vocalist Collette Warren. This year expect no let up with further material due on Intrigue as well as Lockdown. Their tracks continue to receive big support from Storm, The Insiders, Physics, Random Movement, Eveson, Cybin, Raw Q and many more.